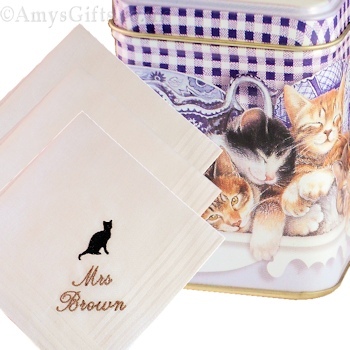 Set of three white cotton handkerchiefs embroidered with a black kitten silhouette and a name or initials personalised in your choice of thread colour. Just fill in the options boxes and choose what colour embroidery thread you would like for the name and the font style. (Pictured tin is not included). Just fill in the options boxes and choose what colour embroidery thread you would like for the name and the font style. (Pictured tin is not included). Ladies 28cm cotton hankies x 3 (can be used for a childs gift as childrens hankies are the same size). Make someone very happy with a unique gift dedicated to them. Please allow at least 2 days for personalised orders to be dispatched as they are made to order by Amys Gifts.